A tightly woven handmade Viking Knit gold chain supports several freely moving, charm style pieces. A wire wrapped banded jasper, tiger's eye quartz, natural yellow quartz crystal, and beaded dangles made with vintage German glass beads. Wrapped wire tubes create spacer "beads". 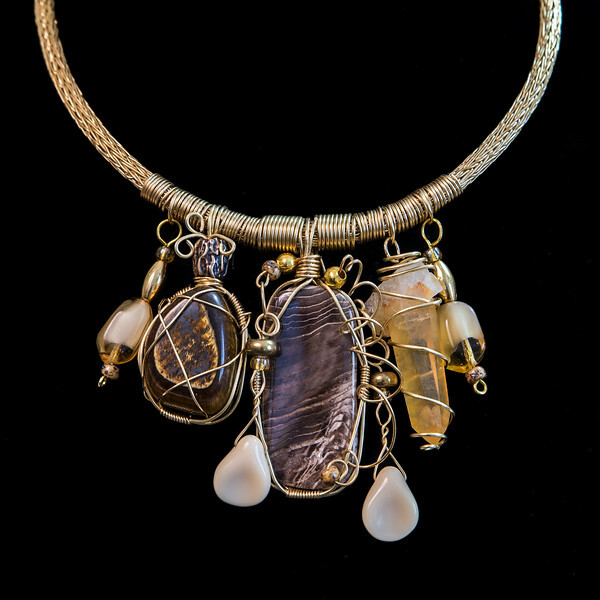 This is a lovely, warm toned, natural, earthy necklace that gets TONS of compliments. Nice, easy hook and eye closure. It measures approximately 16 inches. An extender chain can be added if you like.